We are sadly back in school this week after a beautiful two full weeks off. Our school has several buildings and so we have to walk outside when switching classes, which should be awfully fun Tuesday morning when the temperature is to be 1° and the real feel is to be -20°. I know it’s nowhere near as bad as in Minnesota or Iowa, but it still shouldn’t be fun! I like the cold weather, but preferably not when I’m wearing tights! 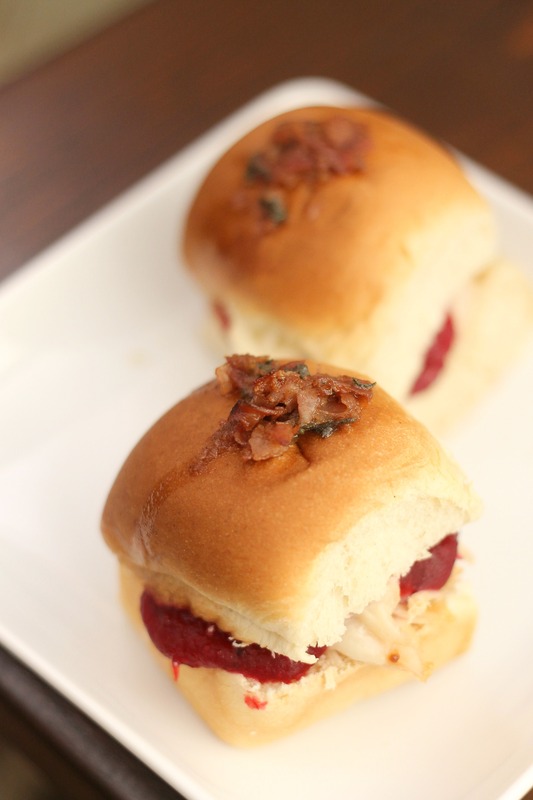 This is the time of year for comfort food, for sure, and these sliders fit the bill. We made these sliders when relatives came over on Saturday, with a few adaptations from the original. Instead of the amazing-sounding cranberry bacon chutney, we made this cranberry butter since we were in a time pinch (we had yearbook that afternoon and had very little time for prep in the morning) and it was great. Our mom was roasting a turkey, so we used that instead of deli turkey. It was delicious that way, but if you don’t have leftover turkey, we would recommend using deli meat- there’s no sense in roasting a whole turkey just for sandwiches! Preheat oven to 375 and line a rimmed baking pan with foil.Brown the butter in a skillet and stir in prosciutto and sage. Make sandwiches, starting with a slice of turkey, cheese and then a dollop of cranberry butter. Place sandwiches in the pan so that they are close together. Brush with butter and sprinkle over the prosciutto and sage that is leftover in the skillet. Bake for 15 minutes until the sandwiches are hot through the cheese is melted. Serve and enjoy!